How extreme is the Dakar Rally? Well how many races do you see cars coming in on the towstrap of a competitor? I hope the pilot doing the pulling here got some good karma, because the dangling derelict in this clip went on to finish 6th in class. 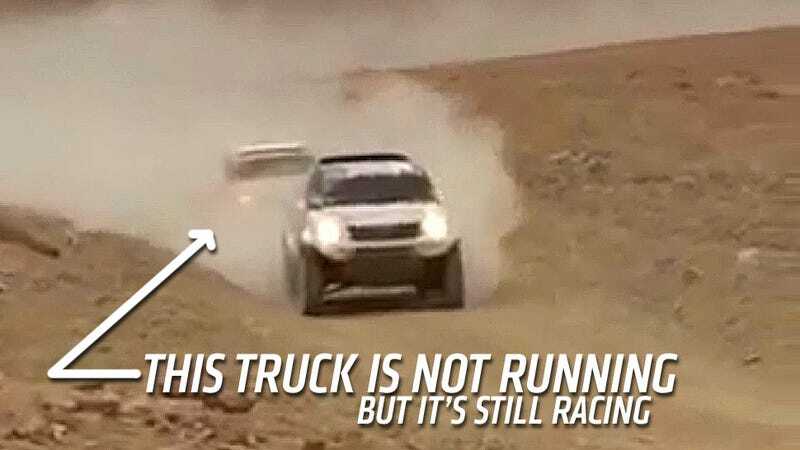 Yes, you are penalized for being towed but it's not enough to disqualify you in the Dakar. #311 out front here is driven by Marek Dabrowski of Poland, who finished his first Dakar in 7th and ended this year's event in 23rd overall. Frenchman Christian Lavieille, who you can see hanging on for dear life in his own Hilux (#309) moved steadily up the pole over the course of the rally getting up to 5th place at the end of Stage 11 and winding up in 6th. I think he owes Dabrowski a beer or two for the assist here, what do you reckon?